When New York women won the right to vote in 1917, the national suffrage movement received a huge shot in the arm after the number of women voters doubled nationwide. The state’s 1917 victory can be traced, in part, to how the movement utilized the media, as well as benefitted from sustained and substantial grassroots organizing. New York’s women organized the state from top to bottom for the vote, and the movement’s visibility and victory paid off when the tide turned nationally. 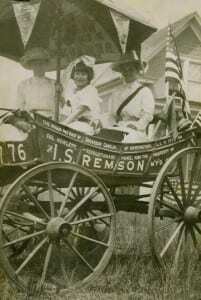 When socialite Rosalie Jones, social justice activist Elisabeth Freeman, and community organizer Edna Kearns hit the trail with their horse-drawn wagons in 1913, their campaigning paralleled similar activities throughout the state and nation where the movement spread its message successfully through press releases, interviews, and photo opportunities. Suffrage parades, rallies, soapbox speeches in the streets, pageants, torch-light processions, as well as decorated wagons and autos, represent just a few examples of a public visibility that sent a distinct message: the suffrage movement was on a roll. Articles about the suffrage movement and its tactics sold newspapers. Publishers understood this as they opened the doors to offer paying positions to women reporters who took advantage of newly-created employment opportunities. The horse-drawn campaign wagons used by Freeman, Kearns and Jones provided mobility for community organizers. Campaign wagons and automobiles became attention-getters. A woman driving an automobile or horse-drawn wagon may not sound like radical and cutting-edge behavior today. But during an era when these vehicles hit the streets for the cause, they represented novel and successful movement tactics. Wagons and autos required skill in driving. The vehicles provided instant speakers’ platforms. Crowds responded to the suffragists’ impromptu demonstrations and rallies with curiosity and emotion. Footage of the wagon used by Jones and Freeman to carry them to Washington, DC to join the 1913 national suffrage parade has been preserved in an early example of film that provides yet another example of the extent to which movement activists focused on publicizing the cause and interacting with supporters and male voters in communities large and small. Kearns, Freeman, and Jones wrote articles, gave interviews, and served as press agents for the suffrage cause. They understood and took advantage of the emerging power of newspapers in the New York City metropolitan area at the turn of the 20th century. The three activists organized for the franchise on Long Island, in NewYork City and Washington DC. They made certain that reporters and photographers were available to document every aspect of their wagon and auto campaigns. 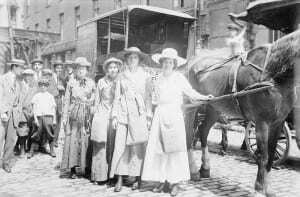 When Elisabeth Freeman and others drove a wagon to Boston to promote Votes for Women in 1913, the trip received considerable media attention. Freeman demonstrated a sophisticated knowledge of how to leverage the news media for organizing purposes in support of a variety of causes, including a campaign to end lynching in the South, plus efforts to involve working women in the suffrage movement. Freeman not only trained in England with the Pankhursts, but she also served time in a London prison to express her commitment to women winning the vote. Rosalie Jones took advantage of the value of wagon campaigning when traveling to Ohio with Freeman by making certain all her actions and opinions were reported to the press, both factual as well as human-interest subject matter. In addition, Jones campaigned throughout Long Island driving her little “yellow wagon” on behalf of the cause. Rosalie Jones didn’t hesitate to take advantage of her family’s social standing on Long Island to support and publicize her high-profile image as a suffrage activist. Even though Jones’ family members didn’t support her insistence on blowing a bugle for women’s voting rights and designating herself as a suffrage “general,” Rosalie persisted. Edna Kearns worked as a suffrage editor for the Brooklyn Daily Eagle and a columnist for many New York metropolitan newspapers. She was active in Long Island suffrage clubs, wrote and distributed press releases for local and state suffrage campaigns, and became a congressional representative for Alice Paul and the National Woman’s Party on Long Island in the campaign for the 19th amendment. The story of the “Spirit of 1776” horse-drawn wagon used by Edna Kearns to organize on Long Island and participate in NYC suffrage parades received newspaper coverage, including in the New York Times, Long Island and other metropolitan papers. The “Spirit of 1776” suffrage wagon, now in the collection of the New York State Museum, is believed to be the only horse-drawn wagon available for public exhibition that represents the extensive on-the-ground campaign efforts to bring about the franchise for women. After 1920, other wagons and autos used in New York and around the nation were returned to daily service, or their history was not preserved as part of American history. Geoffrey N. Stein, retired transportation curator for the NYS Museum, has called the “Spirit of 1776” a “prime artifact” of the suffrage movement. As such, the wagon should be a prime candidate for exhibition in 2017 during the New York suffrage centennial and the national suffrage centennial in 2020. So far, New York State hasn’t moved in the direction of planning its 2017 suffrage centennial. If and when it does, the “Spirit of 1776” wagon, now stored in a state museum warehouse near Albany, will be ready to roll again and represent a rich part of women’s history that’s now increasingly coming to public attention. For more information visit the websites for suffrage activists Elisabeth Freeman and Edna Kearns document their lives and activism. Historian Natalie Naylor and author Antonia Petrash have written about Rosalie Jones, Elisabeth Freeman, and Edna Kearns in their respective books Women in Long Island’s Past (2012) and Long Island and the Woman Suffrage Movement (2013). Archival film of the 1913 wagon trip and hike to Washington, DC can be also be viewed online. 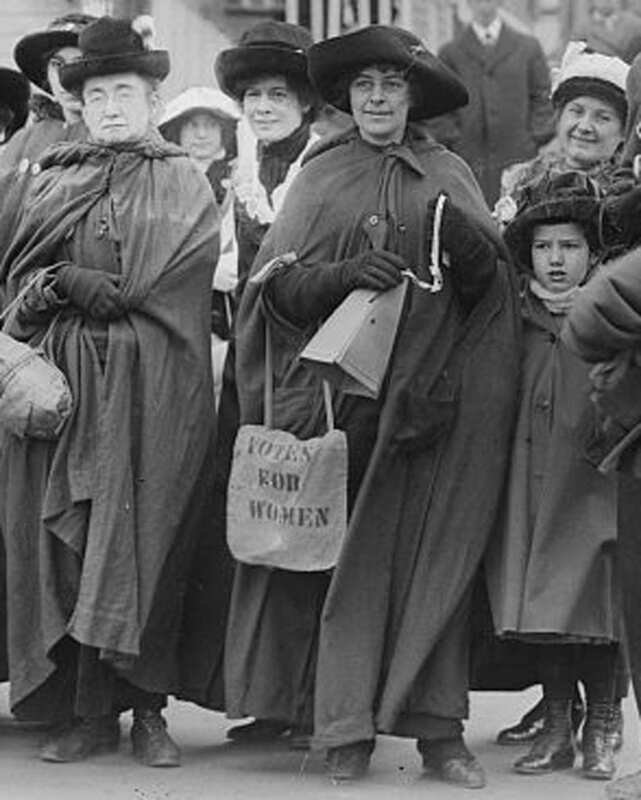 Photos, from above: Suffrage activists who left New York City for Albany on foot in January 1914. Left to right: Ida Craft, Elizabeth Freeman, Rosalie Jones, Serena Kearns, Edna Kearns (Photo: Library of Congress); Elisabeth Freeman (right) and others on their way to Boston to spread the message about Votes for Women, 1913 (Library of Congress); and the “Spirit of 1776” suffrage campaign wagon, 1913. Manhattan and Long Island campaign. Left to right: Edna Kearns, Irene Davison, little Serena Kearns. (Photo from the family collection of Edna Buckman Kearns). Thanks for bringing our attention to Edna Kearns, Elisabeth Freeman, and Rosalie Jones and their “spirited” and suave campaigns. I can’t wait to see the “Spirit of 1776” wagon rolling through the streets of Albany, Seneca Falls, and New York City in 2017. It just has to happen!